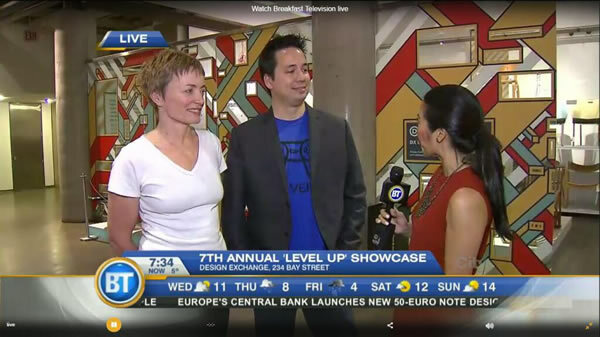 Emma Westecott and Steve Engels are interviewed by Breakfast Television reporter Melanie Ng (April 5, 2017 via Twitter). Over 2,000 students, instructors, industry insiders and gaming fans will crowd the Design Exchange for the seventh annual Level Up Showcase on Wednesday, April 5, an event that has become known for uncovering new creative talent. Associate Professor, Teaching Stream, Steve Engels, co-founded the event with Emma Westecott, an assistant professor at OCAD University, seven years ago. “This event brings together game design students and gaming enthusiasts from all over Ontario, showcasing Ontario’s young talent to industry, media and the world,” says Engels. Nina Haikara talked with Engels about game design at U of T and trends to watch at this year’s Level Up Showcase. Read the full Q&A with Engels at U of T News. Watch Engles and Westecott on Breakfast Television (Toronto).